Carlos, wife Kristin and daughter. Died: March 16, 2006 in Operation Iraqi Freedom. 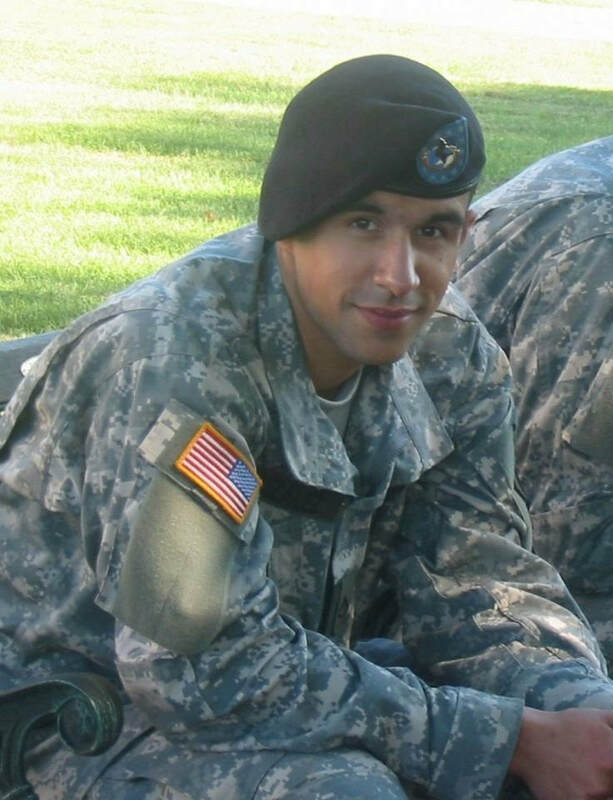 Unit: 101st Military Intelligence Detachment, 501st Special Troops Battalion, 101st Airborne Division (Air Assault), Fort Campbell, Ky.
Corporal Carlos M. Gonzalez was born May 23, 1983 in Passaic, NJ and raised in Middletown, NY. He graduated from Minisink Valley High School in 2001, and was a member of the JROTC during all four years of high school. After graduation, he studied at Military College in Valley Forge, PA focusing on communications. Carlos, a signal support systems specialist, entered the Army in May 2004 and arrived at Fort Campbell, KY in January 2005. Besides his loving parents of Middletown, he is survived by his beloved wife, Kristina, his daughter Isabella Maria Gonzalez, both at home; his brother, Alex; his mother and father in law Kenneth and Elizabeth Oliver; grandparents Alejandrina Gildemeister, Victor Gonzalez, and Ana Rosa Miranda grandparents in law Peter and Frances Hartman and Susan Camus; and many friends and relatives. Carlos was assigned to the 101st Military Intelligence Detachment, 501st Special Troops Battalion, 101st Airborne Division based at Fort Campbell, KY. He was killed March 16, 2006 when a mortar round detonated in Tikrit, Iraq. Carlos was posthumously promoted to the rank of Corporal. Throughout the lives of every man and woman who have ever lived, there comes a point where one comes to terms with the mortality shared between all living beings. The fact that death will eventually come to all people can be seen as part of life. The sacrifices of heroes, however, can sometimes live far beyond any one person's lifetime. On the day of March 16, 2006, Spc. 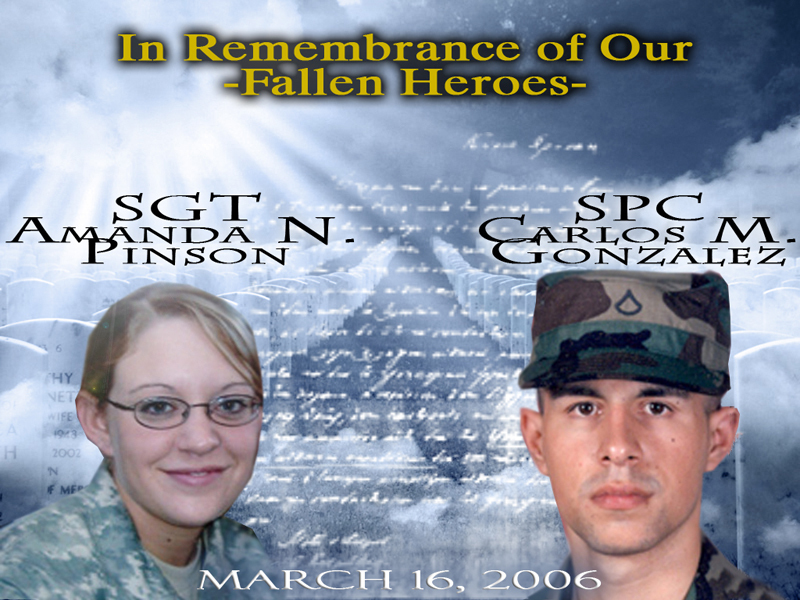 Amanda N. Pinson and CPL Carlos M. Gonzalez were victims of a rocket attack on Contingency Operating Base Speicher, near Tikrit, Iraq. The two Soldiers lost their lives as a result of the impact and have been honored by the military intelligence Soldiers serving at the site three years later. During a gathering of Soldiers organized by the G-2 section at division headquarters on COB Speicher, the memory of their loss was carried on once more. The deaths of Sgt. 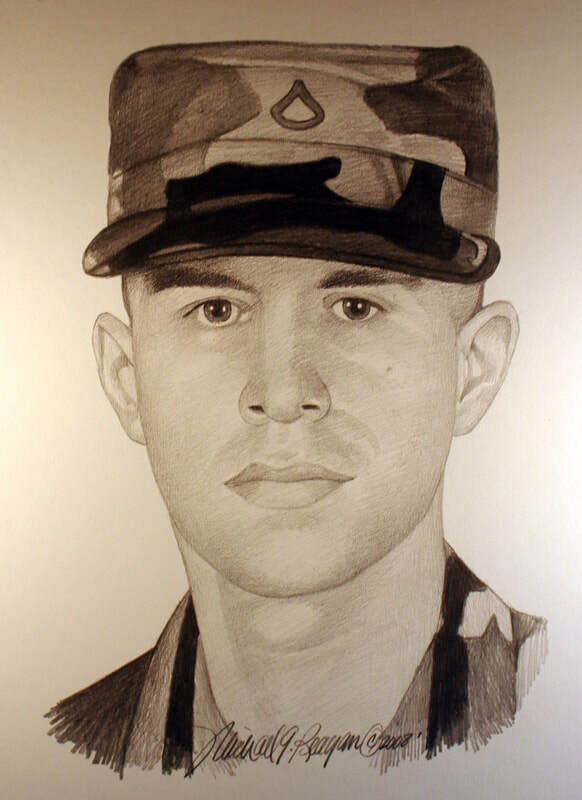 Pinson and CPL Gonzalez, both Soldiers with the 101st Airborne Division, weighed heavy on the emotions of all who knew them and became personal for the 101st Division. As their time in theater expired, the duty to bring the man responsible for the attack was passed onto the 25th Inf. Div., who assumed command of COB Speicher. This duty was accomplished during Tropic lightning's prior deployment, as Task Force Lightning Soldiers captured the man responsible for the attack. Hoae'ae-Lewis was present at COB Speicher to bring the man off of the truck which brought him to justice. "The sight of this cowering, weak man -- scared to death of us -- shows what kind of person would do something like this," said Sgt. 1st Class Daniel Hoae'ae-Lewis, signals intelligence non-commissioned officer-in-charge, Information and Security Company, 25th Special Troops Battalion, 25th Inf. Div. The headquarters building, as noted by Hoae'ae-Lewis, still shows the scars inflicted by the rocket attack on that day. Debris from the battered wall remains scattered across the gravel below, as if time stands still. Time, however, can only move forward for the Soldiers who still support the conflict which claimed the lives of Sgt. Pinson and CPL Gonzalez, whom received posthumous promotions from the ranks of specialist and private first class. Pinson was the first female signal cryptologist to lose her life during Operation Iraqi Freedom.The building which serves as the office for intelligence operations and the building in which Sgt. Pinson worked, was renamed "Pinson Hall" to honor her memory. Recognizing their sacrifices as a part of their history and military heritage, on this day, their leadership urged Soldiers to never forget. "These Soldiers gave the ultimate sacrifice," said Sgt. Maj. John Garrison, G-2 Sgt. Maj., Information and Security Company, 25th Special Troops Battalion, 25th Infantry Division, to an audience of Soldiers gathered in remembrance. "Take time out to remember history and the think about what matters." "We're still in contact with the 101st Soldiers who lost them," said Hoae'ae-Lewis. "We share that justice together." Through death, the bravery and loss of heroes, such as Sgt. Pinson and CPL Gonzalez, will extend their lives indefinitely through the hearts and minds of those whose lives they touched.